Singapore Post said on Thursday it accepted the financial penalty imposed by the Infocomm Media Development Authority (IMDA) for missing quality of service standards in 2017 and that it would immediately take measures to improve. “We deeply apologise to our customers for our service failures. We have heard their complaints and feedback; we feel their frustrations and seek to win back their trust,” Paul Coutts, SingPost CEO, said in the company statement on Thursday. “We will continue to explore harnessing new technology and infrastructure to enhance our delivery process – and most importantly, investing in the welfare of our workforce,” he added. SingPost said it was reassessing the mail-carrier job, pointing to the rapid expansion of e-commerce. “This has raised the postman’s workload with a significant rise in package deliveries being made to doorsteps, over and above the delivery of mail to letter boxes,” SingPost said, noting that over the past few months, during the holiday season, each mail carrier had an average of 50-60 doorstop deliveries a day. Among the new measures, SingPost said it would hire another 100 mail carriers and redeploy 35 mail-drop drivers to become full-time mail carriers. It also planned to increase compensation, with incentives for successfully delivering trackable items to the doorstep, as part of a broader salary-structure review. SingPost said it aimed to reduce missed deliveries by extending delivery slots to weekday evenings and Saturdays, while offering overtime pay for mail carriers volunteering for those slots. To improve parcel collections, SingPost said it would increase the number of dedicated counters and staff at post offices, adding that volunteers from the corporate office have been helping out on weekends. SingPost said it would reduce non-core mail businesses, such as advertising mail, to improve the services levels of its core mail delivery. On Thursday, IMDA imposed a financial penalty of S$100,000 on SingPost for missing standards on delivery of local basic letters and registered mail in 2017. 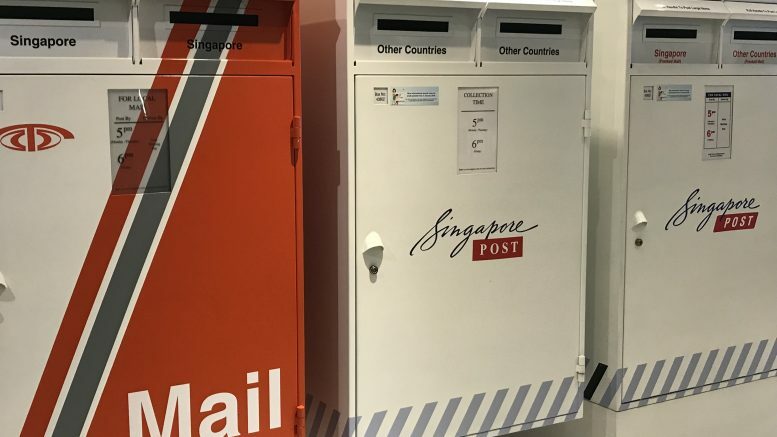 Those standards require SingPost to delivery 99 percent of local basic letters within the central business district and 98 percent of local basic letters to destinations outside the CBD by the next working day, IMDA said. IMDA said this wasn’t the first time SingPost had failed to comply with quality of service standards and the margin of failure in 2017 was “significant” compared with previous non-compliance. IMDA is still assessing SingPost’s performance for 2018, with the results to be published by mid-2019, the authority said, adding it was also investigating a late January incident of a postman discarding mail, which would be an offence under the Postal Services Act. That mail carrier has been arrested. “The recent service lapses by SingPost indicate gaps in SingPost’s processes and we require them to implement measures urgently to meet the public’s evolving postal needs,” Aileen Chia, IMDA’s deputy chief executive and director-general for telecoms and post, said in the authority’s statement on Thursday.